Kristin has owned, managed and trained at Coventry since 1993. Prior to that she was a freelance instructor who studied with well known trainers, attended and participated in numerous USDF Educational events - Instructor Trainer Seminars and Judges Seminars. Kristin travels to barns for lessons and to assist riders with their horses. for hunt seat, eventing & dressage. You do not have to take lessons here to board at Coventry. We cater to the care of the horse. for the Spanish Norman Registry. Kristin's horse was also the highest scoring Spanish Norman Horse in the country that showed in dressage. He also won the Spanish Norman Registry's High Point Award in 2012 ! Kristin travels for lessons and clinics. With over thirty years of teaching experience, Kristin enjoys sharing her knowledge. In 2012 Kristin started showing again after a 23-year lapse. She was ranked 203 in the nation out of thousands of professional USDF riders. She and her Spanish Norman horse also won the National Championship for the USDF ALL Breed Award in 2012 and won the Spanish Norman Registry's High Point Award for 2012! She and Bracchus also won the USDF All Breed Award in 2014 showing First Level. In 2015, showing Second Level, Kristin and Bracchus ranked 150 in the nation of all riders at Second Level. She has participated in two USDF Learner Judges programs, she has passed the USDF Instructor's Training in 1989 and audited the program in the early eighties. In 1989, Kristin was the top placing rider winning Region 1 (six states) as an Adult Amateur on her Trakehner mare Erle's Bliss. 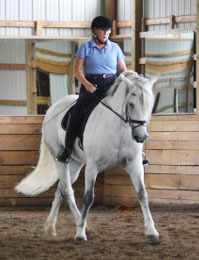 An avid writer, Kristin's articles have appeared in The Chronicle of the Horse, HorsePlay Magazine, Dressage Today, Dressage & CT and she had a series in the USDF Connection's magazine in the late eighties and early nineties. Many of these articles are on this website. She presently has a series in Pittsburgh Pet Connections Magazine on the Gymnastic Training of the Horse. 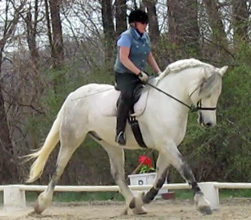 (www.pghpetconnections.com) All horses benefit with dressage training made simple to supple, strengthen, balance and non evasively gymnastically train the horse. Visit Kristin's Home School Your Horse Facebook page for training tips. Lessons in dressage (or gymnastic training for the horse) are available at Coventry as well as hunt seat and eventing. We have three dressage trainers at Coventry and two jumping trainers. Our students learn to not only ride but train their own horses developing the skills to be a true and tactful equestrian. The owner/manager, Kristin Hermann, specializes in teaching good riding / training with a natural horsemanship (non evasive) approach - the result is harmony between horse and rider! Horses are never coerced into performing and you can see this training philosophy portrayed in their attitudes. Students from Coventry compete in dressage, hunter, and jumpers plus event. A well-trained, balanced and relaxed horse will perform better for any discipline. And, correct riding skills will benefit a rider for a lifetime of enjoyment in their chosen equestrian discipline. Outside clinicians teach at Coventry and outside trainers are welcome. Coventry hosts Three Rivers Equestrian Association (TREA) sanctioned dressage shows as well as sanctioned Western Pennsylvania Dressage Association (WPDA) shows annually. See upcoming events for details. Contact Kristin about riding or boarding at Coventry and/or for a farm tour. * The Blythedale Romance is a book written by American writer Nathaniel Hawthorne, who is also author of The Scarlet Letter.